Noli De Castro and Bernadette Sembrano will kick-off the ABS-CBN election coverage at 5am, followed by Julius Babao and Karen Davila at 10am, Ted Failon and Ces Drilon at 3pm before the special edition of “TV Patrol” at 6:30pm. Henry Omaga-Diaz and Lynda Jumilla will continue the coverage at 8pm on ABS-CBN Sports + Action, after which the coverage goes back to ABS-CBN with “Bandila” anchors Babao, Davila, and Drilon at 10pm, then Omaga-Diaz and Jumilla return on-air at 1am. Serving as social media anchors are Gretchen Ho, TJ Manotoc, Gretchen Fullido and Dyan Castillejo. ANC, the ABS-CBN News Channel will also provide live updates from precincts, news reports, interviews, and analysis beginning 3:30am on Election Day (May 9) with Cathy Yang and David Celdran in the first shift. Davila, Nancy Irlanda, Karmina Constantino, TJ Manotoc, Ron Cruz, Edric Mendoza, Tony Velasquez, Jumilla, Teddy Boy Locsin, Tina Palma, Gigi Grande, and Christian Esguerra will also do anchor duties while Paolo Abrera, Lexi Schulze, and Ria Tanjuatco will alternate for the social listening segment. On Election Day, Filipinos all over the world will not just be informed. They will also be heard. ABS-CBN News, the largest news organization in the country, is all set for an extensive and comprehensive news coverage of the Philippine national elections on May 9 that will synergize all its news platforms to deliver news and information on the elections to Filipinos, wherever they are --- while also giving importance to people’s experiences and views by reporting on the issues and topics being talked about on social media. ABS-CBN Integrated News and Current Affairs head Ging Reyes, said that a social media news desk dedicated to monitoring what people are talking about online has been formed to boost the network’s “Halalan 2016” marathon coverage that will begin at 5am this Monday (May 9) on ABS-CBN and continue until 11:30am of Tuesday (May 10). “We’ve seen how Filipinos have become even more active and involved in the upcoming elections with the help of social media. It's important to highlight the conversations online which represent the views of hundreds of thousands of Filipinos. Incorporating social media listening in our coverage is our way of showing that we value the voice of the people, especially at this critical time in our country's history, ” she said. ABS-CBN’s top broadcast journalists will take turns in anchoring ABS-CBN News’ special coverage of the elections, dubbed the “Halalan 2016: Ipanalo ang Pamilyang Pilipino” election coverage, which will feature news reports straight from any of the 40 live points setup by ABS-CBN all over the nation, reports from ABS-CBN news bureaus abroad, and also a social listening segment that will show the hottest topics and buzz online. Filipinos can also experience ABS-CBN’s all out news coverage in its other platforms – DZMM Radyo Patrol 630 on radio; ANC, the ABS-CBN News Channel on cable TV; DZMM TeleRadyo on cable TV and digital TV; and online via http://news.abs-cbn.com. 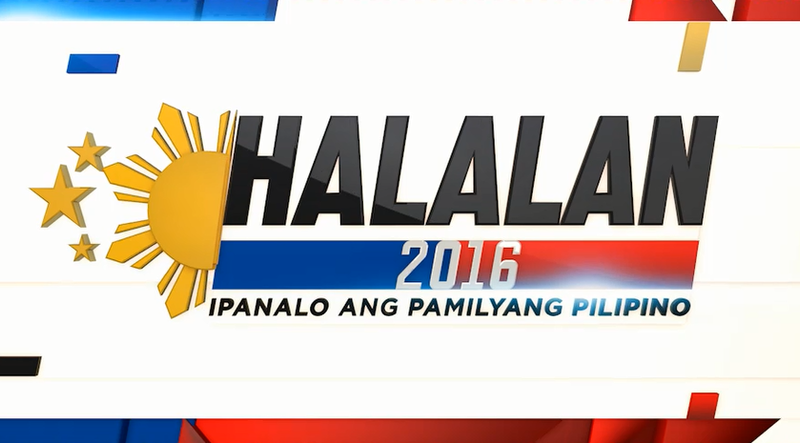 DZMM’s “Halalan 2016” special coverage will begin as early as 10pm of May 8 and will continue until 12 midnight of May 11, to ensure Filipinos will get hold of the latest and breaking news as the voting and the vote counting progress. Failon, Omaga-Diaz, and Davila will also anchor for DZMM, alternating with DZMM’s program anchors and Radyo Patrol reporters led by Anthony Taberna, Alvin Elchico, Gerry Baja, and Vic De Leon-Lima, Ricky Rosales, Noel Almar, Rod Izon, David Oro, Dexter Ganibe, Johnson Manabat, and Ruby Tayag. Filipinos may also stay updated online via http://news.abs-cbn.com. Netizens may also visit ABS-CBN News’ “Halalan 2016” microsite (http://news.abs-cbn.com/halalan2016) that offers a compilation of the latest election news, special reports on elections issues and candidates produced by ABS-CBN, and other interactive features that can be helpful to readers as they make their vote count in this elections. People can also get the latest election results via Twitter. Beginning evening of May 9, after the polls close, any Twitter user with a public account can tweet @ABSCBNNews and use the hashtag #HalalanResults to get a quick personalized and automated card featuring the latest results for the Presidential, Vice Presidential, Senatorial, and House of Representatives (Party-List) seats. This is still part of ABS-CBN News' election campaign "Ipanalo ang Pamilyang Pilipino" that encourages Filipinos to get involved in the elections and to vote with the welfare and betterment of their families in mind.